Reuschtools CopyCD is a reliable and intuitive application that enables you to easily clone data from CD, DVDs and Blu-Ray discs. The program integrates into the Explorer context menu, so you can access it by right-clicking on a CD, DVD or Blu-Ray drive. In the app’s main window you can access a Master and a Copy menu - the first one lets you select the source disc and the second enables you to choose an output location. The tool supports CDs, enabling you to rip audio tracks, but also clone images ad documents (although videos are not supported). 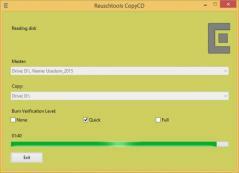 Reuschtools CopyCD also lets you convert a folder to ISO, as well as burn ISOs to discs. Convert various media formats to DVD compliant streams. gBurner is a CD/DVD burning tool. WinISO 6.4.1.6137 Converts BIN to ISO and more!